In the storm season it is easy for staff to extend hours to meet KPI or SLA timeframes. need for extended sleep during days off work. Fatigue can usually be traced to one or more of your habits or routines. The level of fatigue varies for individuals as it is dependent on sleep, physical exertion, length of shift, poor eating habits, driving times to and from work or lack of sleep. Ambrose Building is proud to announce that we are an inaugural member of a new type of health facility on the Sunshine Coast. Hunt’s Fitness provides a mix of strength and conditioning classes that you would expect with any top line facility, along with a series of high intensity and interval training, but also they have a strong commitment to mind and body with a full range of yoga and pilates classes. Thus far all of our staff who have taken up memberships have tried the mind and body stream and even after two short weeks, the management of workplace fatigue and increased productivity is absolutely evident. Finally make sure your sleeping patterns and habits allow you to get periods of undisturbed, restful sleep each night. Researchers have confirmed that 17 continuous hours awake is equivalent to a blood alcohol content of 0.05. If your sleepless hours add to 21, your blood alcohol content can reach 0.08. Safe Work Australia has published the Guide for Managing the Risk of Fatigue at Work. 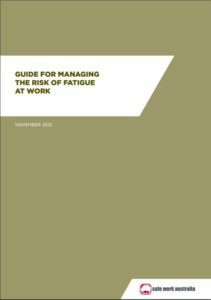 The guide takes a practical approach to explaining and managing fatigue and includes a Fatigue Checklist where employers and employees can identify risks of fatigue and set about implementing control measures to counter them. To review the report click on the image below.